Fall is the best. It seems like every weekend I know another group of friends that fled the city for the thrill of picking apples in this slightly mild autumn. I am biased for the cold weather seasons because it opens the doors to a spectrum of flavors that evoke the warmth of new beginnings. I love creating seasonal sangrias because it serves as a celebration of the it flavors of the moment. However, this one is special because it requires no wine, tastes delicious and, of course, is so simple to make. 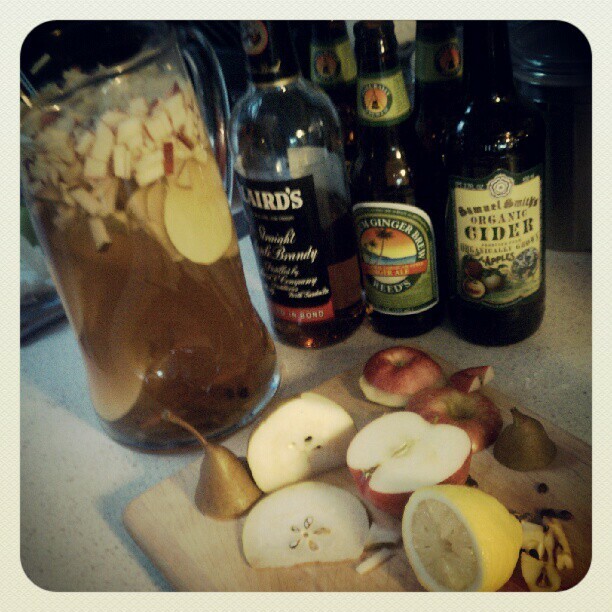 This autumnal sangria is based on apple brandy (here I used Laird’s), ginger beer, hard cider, spices and fall fruits. Sangrias allow you to be quite liberal in what you add, but I recommend not compromising on Bosc pears. Their flavor and texture are so appropriate for the season and look beautiful, too. Combined with chopped red apples and fresh lemon juice, all the ingredients make this drink crisp, sweet and very drinkable. Chop pears and apples into small cubes and add to pitcher. Cut circular rounds of pears for decoration and/or garnish. Add liquid ingredients, cinnamon sticks and the juice of half a lemon. Stir to combine. Chill in the refrigerator for about an hour and serve over ice. I love you full catalogue of Autumnal drinks, but this sangria is the best!